I bought some Essence polishes from the "Essence Twins Collection" and some Catrice from the new collection called "Out of Space". Edward (Essence), Bella (Essence), Louise (Essence), Blair (Essence), and Chuck (Essence). Choose Me (Essence), it's very close to Zoya Charla. Beam Me Scotty! (Catrice), a teal that is supposed to have a Suede finish! OMG, I want to try it!, and Houston’s Favorite (Catrice), a gorgeous dark shimmery teal. PS I've received some awards from these 2 lovely ladies, Polish Amor and Carly at Lacquerd Lover. I will write the corresponding post asap but I have to think carefully to who I'll give the awards back!lol Anyway, thank you so much to you, Polish Armor and Carly! Ohhh wow these I cannot wait to see swatched!! 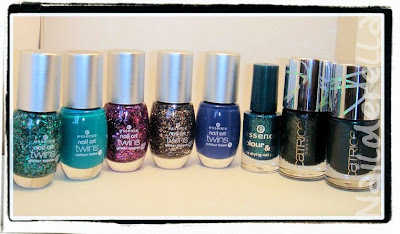 I love love LOVE Essence, but they dont have all the cool stuff in ireland wish I could get the polish twins :) I'll settle for seeing the swatches lol! Oh wow , These are all splendid . Waiting for all the swatches ! nice haul. i've been meaning to make a trip to cvs to pick up some of the essence twins. i cant wait to see them swatched! I will try to swatch some today and post the pictures tomorrow. What a haul! Can't wait to see the Houston’s Favorite better. Is it also from the Out Of Space LE? Yes, Simona! Houston's favorite is also part of the "Out Of Space" collection.